Manzanilla olives are also called Spanish olives or green olives. They are native to Spain but are also grown in California. They range in color from brown to green and are typically found in jars at the supermarket. Some versions are stuffed with pimentos, garlic or almonds. Incorporating manzanilla olives into your diet offers several health benefits due to the nutrients they contain. Keeping your fat and calorie intake within a healthy range allows you to control your weight and lower your risk of heart disease and diabetes. A serving of manzanilla olives is usually 5 olives and contains 20 calories and about 2 grams of fat. As long as you stick to a portion or two, you can enjoy manzanilla olives without overloading on fat and calories. Most of the fat found in this type of olive is the unsaturated kind and supports the health of your brain and heart. Five manzanilla olives contain nearly 1 gram of vitamin E, which may not sound like a lot, but most people eat more than one serving of green olives at a time. Adults should get 15 milligrams of vitamin E each day. It fights bacteria and viruses and prevents them from entering your body and making you sick. Vitamin E is an antioxidant and helps counteract the free radicals that occur in the environment and damage cells, contributing to the development of cancer and heart disease. Studies have found conflicting results about how large the benefits are, but adding moderate amounts of manzanilla olives to your diet may reduce your risk of some health problems. While your body does need a certain amount of sodium for muscle and nerve function, getting too much could cause high blood pressure. This increases your risk of stroke and heart disease. The daily recommendations for healthy adults are to get no more than 2,300 milligrams of salt each day. If you have hypertension or heart disease, you may need to limit your intake to smaller amounts. 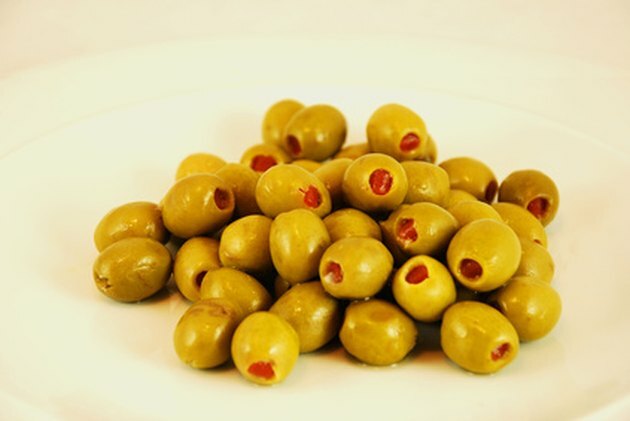 A serving of manzanilla olives contains 210 milligrams of sodium. Eating too many of them could mean getting more salt than is healthy in one day. A serving of manzanilla olives doesn't contain enough of any single nutrient to help you reach the daily recommendations, but they do contain small amounts of several vitamins and minerals that support good health. Five manzanilla olives contain 7 milligrams of calcium, important for healthy bones and teeth, 6 milligrams of potassium, which keeps blood pressure at a healthy number, and 53 international units of vitamin A for disease-fighting benefits.